It’s pumpkin season again… 🙂 So today we will be preparing a Healthy Creamy Pumpkin Soup (Sopa Cremosa de Abóbora) as a main dish to serve for dinner — accompanied by toast points, of course! Happy? I am!!! I simply adore pumpkin, and all of the goodies — both savory and sweet– that can be prepared with it. Just like Americans, Brazilians also use pumpkin to prepare sweet treats such as pumpkin compote in syrup (doce de abóbora em calda), pumpkin brigadeiros, pumpkin flan (pudim de abóbora), pumpkin-coconut sweet bread (pão de abóbora com coco), among other things. However, Brazilians enjoy pumpkin in savory dishes as well, such as soups (both creamy and chunky), stews, mashed pumpkin, and quibebe (steamed pumpkin chunks topped with shredded dried, salted beef sautéed with onions). 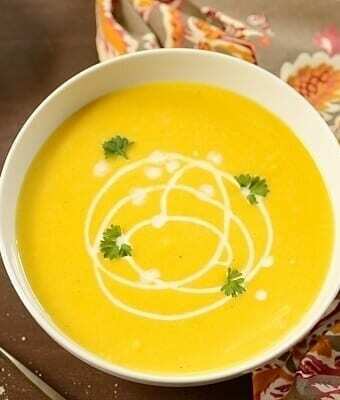 Well, this pumpkin soup is healthy because is prepared with yogurt instead of heavy cream, plus pumpkin is rich in vital antioxidants and vitamins. Another advantage is that our pumpkin soup is quick and easy to make since everything is blended together in a blender. If you have a busy routine (like me), this is definitely one of those time-saver dishes to add to your repertoire, which pleases both adults and children. I am telling you… even my picky eldest daughter tried and loved it. Pumpkin is the fruit for this time around. You can enjoy it as much as you like, without any hesitation! This is a creamy and healthy pumpkin soup prepared with yogurt and loaded with antioxidants and vitamins. It is quick to prepare and gluten-free! Heat a medium pot over medium heat, add the oil and butter. When butter melts, sweat the onion and then add the pumpkin. Saute for a couple of minutes. Add salt, pepper, and the vegetable broth, and then cook on medium-high heat for about 5 minutes (or until the pumpkin is fork tender, if starting from raw). In a blender, puree the pumpkin mixture until creamy. Return mixture to the pot and let cook over medium heat for 5 additional minutes. Add the yogurt or heavy cream, and cook for an additional minute. Remove the soup from the heat. Serve immediately, topping with a drizzle of olive oil and Parmesan cheese. Enjoy! This looks so smooth and creamy Denise. I love veggie soups like this and yours looks like a winner. Thanks, Chris! Yours served in the pumpkin shell looks amazing. Oh yes, it’s pumpkin month! I love all the creations that I see, including this hearty soup! Me too!!!! Fall and winter are the seasons that soups are most consumed at my household and pumpkin, of course, is one of them. and it’s so much lighter than heavy cream! Thank you, Sally! I agree with you. This is why I used Greek yogurt. Its acidity really balances the sweetness of the pumpkin while cutting down fat and calories. Happy Halloween for you too! Denise this soup sounds wonderful! So creamy and so healthy! Love your use of Greek yogurt! 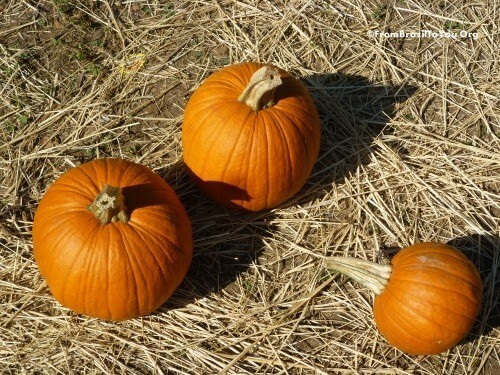 I adore pumpkin – any chance you will post that pumpkin flan you mentioned? Thank you, Shashi! I intend to make a pumpkin flan although I don’t have an exact date to post it here. We are going into Summer, but we have some nights that are still cold, this soup will be perfect then!!! Here is autumn and days are chilly. I hope you can still try this nutritious soup. Denise – this soup sounds wonderful – simply adore your use of Greek yogurt in these! No wonder pumpkin is so appealing! A fruit rather than a vegetable explains so much! A healthier version of Pumpkin Soup is something we all need, especially with so much candy this week. A scrumptious recipe! Denise, this soup looks really looks warm , comforting and it is healthy too! Great! 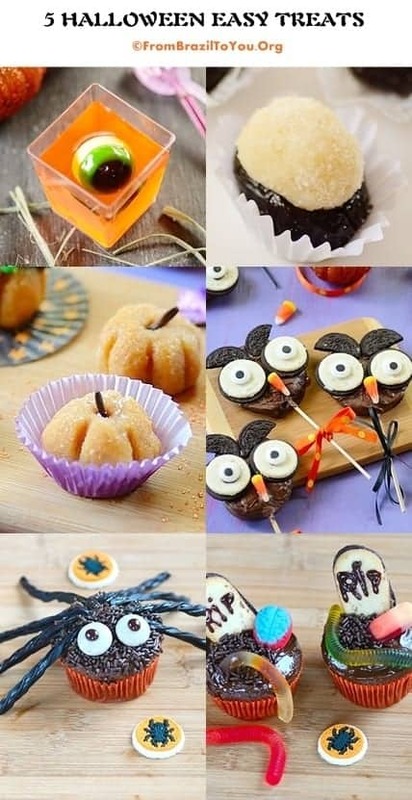 I have some leftover pumpkin and will definitely will be trying this out – especially since my son wants to try out different pumpkin recipes. Thanks for sharing! Thank you for stopping by. I hope you and your son enjoy this which is a fave of mine. “tis the pumpkin season and the soup season. Adore your use of Greek yogurt in the soup. Makes it healthy. Thanks, Lail! I love soups and think fall is one of the best seasons to have them. Marcela: Thanks a lot! It has everything that I love. A fruit!? Mind: blown. Tis the season for soup! I love this color of this pumpkin soup…and yes, Greek yogurt is a perfect as a garnish. With so many treats for Halloween, we had to have this healthy meal. Thank you for stopping by. Thank you! Me too. Every fall I enjoy many dishes and treats made from pumpkin. I have started enjoying pumpkin only recently and soups are my favourite at the moment. 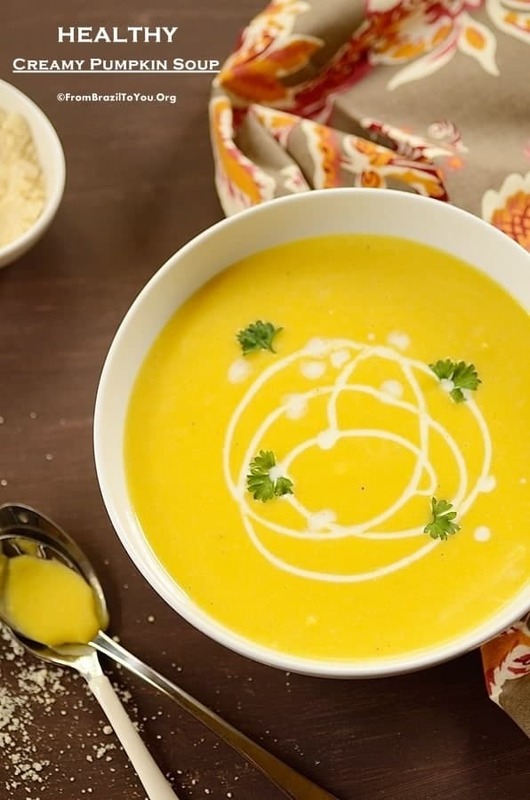 Love this healthy twist on the soup. I bet it will taste amazing too. 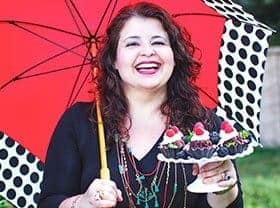 Thank you, Sonali! This is a favorite of mine, one of those dishes that one eat again and again. Thank you, Raymund! Yes, they are quite comforting. Soup is one of my fave fall/winter dishes. Thanks to both of you. I love this so much that I made it again, but this time with butternut squash leftovers. This looks and sounds amazing! I never would’ve thought of adding Greek yogurt to soup! Thanks a lot! Greek yogurt is even better than plain yogurt because it adds a touch of acidity. I have used it a lot to replace heavy cream. It is so good to have you visiting here again. When it is cold there, make this healthy version. You won’t regret it!